Have you ever witnessed a person talking to someone from another country who tries to help the non-native speaker by talking louder? The foreigner is not deaf of course, just looking for words. In a similar vein, people who stutter and have a hard time expressing their words are often perceived as not very bright. How frustrating that must be to be the person struggling to form words smoothly. Stuttering is a communication problem that can make both speakers and listeners uncomfortable and anxious, but it is not a sign of diminished intelligence. When sounds or words are repeated or prolonged and this staggering disrupts the flow of normal speech, and the person speaking also exhibits struggling behaviors such as blinking their eyes, a tremor of the lips, or a general anxiety, that’s stuttering. 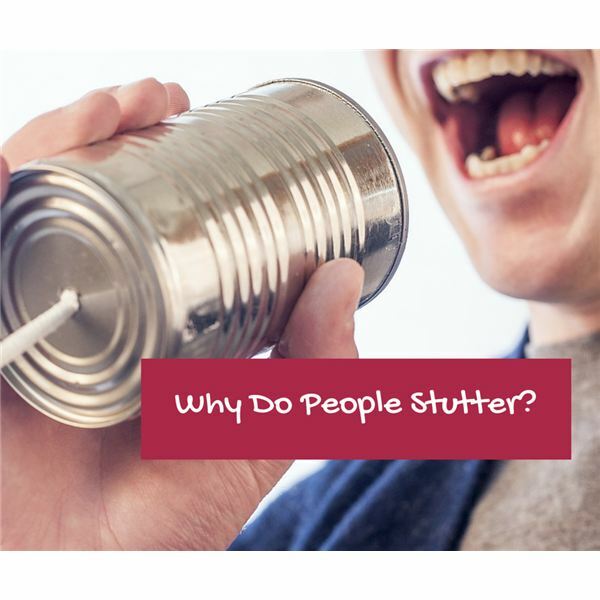 According to the National Institute on Deafness and Other Communication Disorders (NIDCD), there are three theories about stuttering. There are two commonly known types: developmental and neurogenic. There is also psychogenic, which is distress caused by emotional trauma or problems with thought or reasoning, but this is not the topic here. Do you love actress Emily Blunt’s movies? She stutters. Don’t you feel that the resonant voice of Darth Vader in Star Wars is so cool? That’s the voice of James Earl Jones. Yes, he stutters. So do these people: American Idol contestant Lazaro Arbos, news correspondent and former 20/20 co-anchor John Stossel, Country music star Mel Tillis, Bob Love of the Chicago Bulls, Bill Walton NBA Hall of Famer and singer Carly Simon. Marilyn Monroe was a stutterer and Vice President Joe Biden stutters, too. How funny that fatigue is often associated with stuttering. Two other common misbeliefs associated with stuttering are excited talking and rapid talking. Hello. After a long day at school, or a hard day at work, who can sound eloquent? If you are overtired, you probably will not dance as well, paint so carefully, or figure out your bank balance. Fatigue does complicate everything but it is not the reason people stutter. When young children are still learning speech or haven’t mastered any language skills, their abilities lag behind and stuttering is common. Experts have found three genes associated with stuttering and the developmental type often runs in families. Sometimes they will outgrow it. After a stroke, head trauma such as a concussion or any type of brain injury, neurogenic stuttering can occur because the components in the brain that create the signals to trigger speech are slowing in an intermittent manner or firing off in a faulty way, thus making the person stammer. Researchers estimate that about 3 million Americans stutter. It often starts between ages 2 and 5 years of age, and approximately 5 percent of children will stutter at some time in their life. It can last anywhere from months to several years. Boys are twice as likely to stutter as girls are and as they grow older, the number of boys who continue to stutter is three or four times larger than girls. In many cases up to age 12 though, sufferers experience spontaneous recovery. After 12, sadly, the chances of spontaneous recovery dramatically decrease. A mere one percent of adults continue into adulthood. A 2010 movie, “The King’s Speech” is the story of Prince Albert, the Duke of York (played by Colin Firth), who is publicly embarrassed after his speech impediment prevents him from delivering the closing notes at the British Empire Exhibition. Having exhausted every option to cure his stammer, he sees Lionel Logue (Geoffrey Rush), an Australian speech therapist who guarantees that he can help Albert with his problem. Some of the techniques employed in the movie such as putting stones in the mouth to singing speech, to physical relaxation are employed. There are no known cures for stuttering but some interesting things are developing in the speech field. Therapy: A Chinese study says just one week of speech therapy may reorganize the brain, helping to reduce stuttering. The therapy-involved participants repeating two-syllable words that were spoken to them and then reading words presented to them visually. After brain scans, “… it showed that the brain can reorganize itself with therapy, and that changes in the cerebellum are a result of the brain compensating for stuttering,” says study author Chunming Lu, PhD, of Beijing Normal University in China. Gene Therapy: Researchers at Washington University School of Medicine in St. Louis have obtained new evidence that at least some persistent stuttering is caused by mutations in a gene governing not speech, but a metabolic pathway involved in recycling old cell parts. Prosthetic Device: Three teachers at University of Mississippi created a patent-pending device to help people who stutter speak more fluently. Greg Snyder, himself a lifelong stutterer, demonstrated how he could speak much more fluently simply by feeling his throat while he and his colleague Waddell chatted over coffee. “By feeling my throat vibrate when I speak, I get tactile speech feedback, which significantly reduces my stuttering,” Snyder said. They say their portable, battery-powered, easy to use device does not eliminate stuttering but its potential benefit for people who stutter is clear. “One Week of Therapy May Help Reorganize Brain, Reduce Stuttering” Neurology®, the medical journal of the American Academy of Neurology. August 8, 2012, online issue. Effective Counseling in Stuttering Therapy 2nd edition. Memphis: Stuttering Foundation of America, 2006. Booklet. Do You Stutter: A Guide for Teens 4th edition Memphis: Stuttering Foundation of America, 2004. Booklet.